Ann Beach on March 9th. She will be sadly missed. Ann and her husband Francis Coleman had led a group meeting on ‘Scams’ when we met regularly met at the United Reformed Church Hall. Francis and Ann were long term members but Francis died a few years ago. 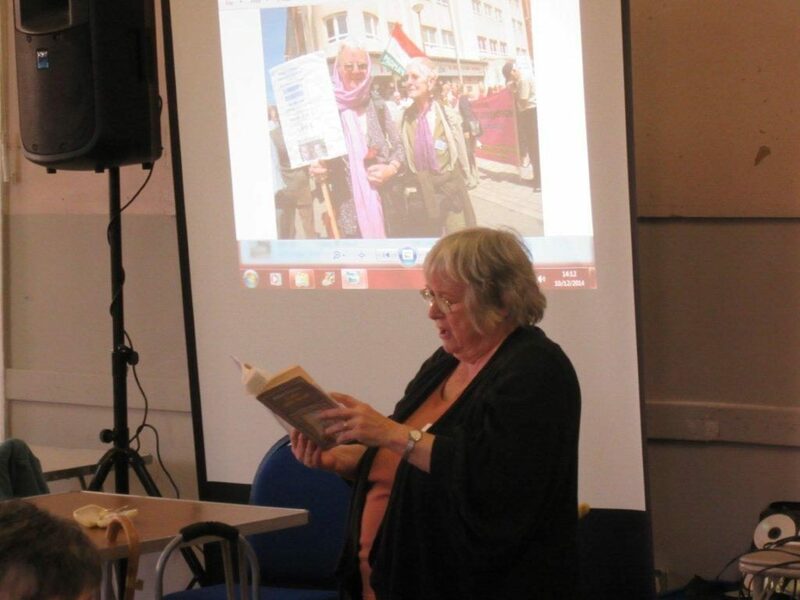 Here is Ann reading one of her amusing monologues at our party December 10th 2014. She performed at several parties. 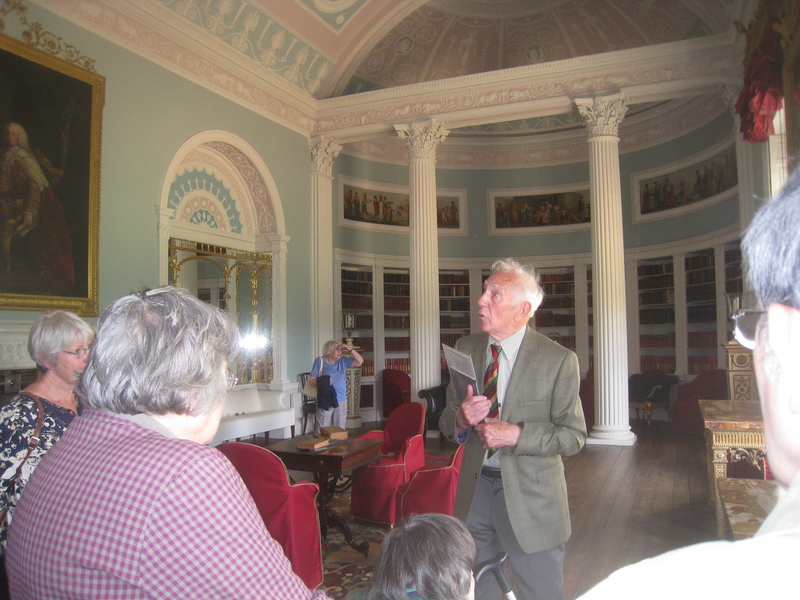 It was a lovely day at Kenwood and we were very lucky to have our member John Boshier use his former guiding expertise to give us an informative and amusing tour of the house. An American tourist and a group from Hampstead Garden Suburb (unfortunately living too far away to encourage them to join our Hornsey group) informally joined our party. 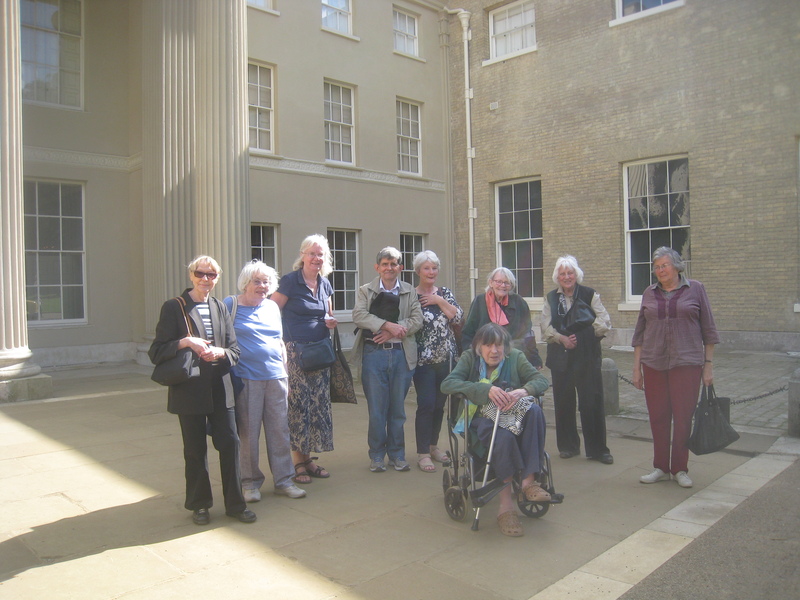 We had an enjoyable walk along the terrace heading for tea and some of us managed to catch a buggy ride back to the front of the house. Our Haringey Community Bus (this time with a lift included) was allowed to drive directly to and from the house front door which was helpful. The interest in the film Belle (now showing at Muswell Hill Odeon) was supported by a life size copy of the original painting of Dido Belle with her cousin at Kenwood. The original has been sent to Scone in Scotland. In the Orangery costumes from the film were also on display. Ann and others were able to attend the Anti- Austerity march of estimated 50 000 last Saturday 21st June. 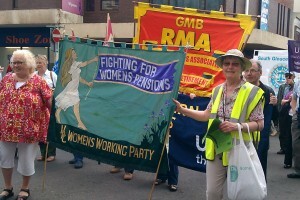 Janet helped carry the National Pensioners Convention banner with Dot Gibson, the General Secretary, and pensioners who had travelled from Liverpool. The march followed a route from Langham Place outside the BBC to Westminster through Regents Street, Picadilly Circus and Trafalgar Square made for a lively audience of shoppers, tourists and theatregoers. Unfortunately there was little coverage on TV. Look out for a report of Pensioners’ Parliament by our delegate Barbara Ryan. 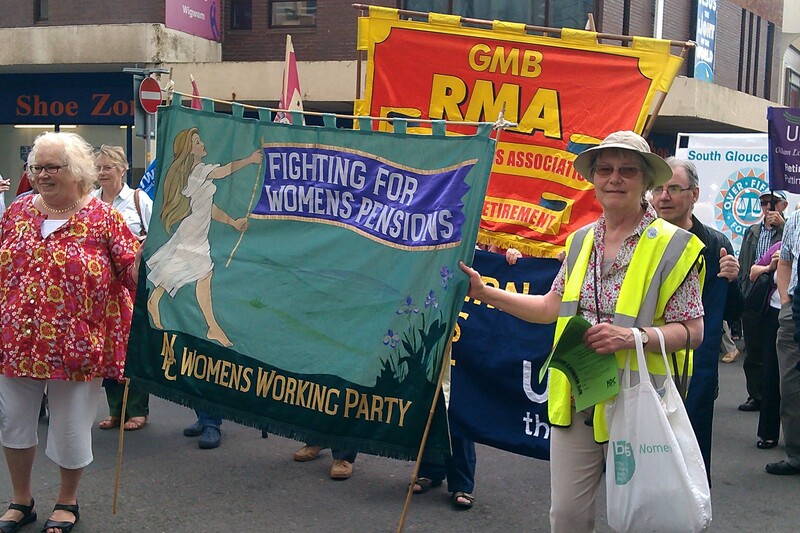 Barbara took this photo of Janet and Rosie Macgregor carrying the Women’s Working Party banner on the march to the Winter Gardens. Parliament endorsed the NPC Pensioners Manifesto 2015; we had sent in our ideas for this.At the General Election in 2015 we will call on candidates to support our 5 point manifesto. indexed to highest of RPI, CPI, earning or 2.5%. 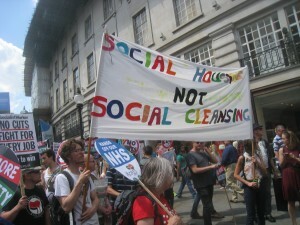 A National Health and Care Service free at point of use and funded through taxation. A legally binding Dignity Code to improve the quality and standards of care for older people. 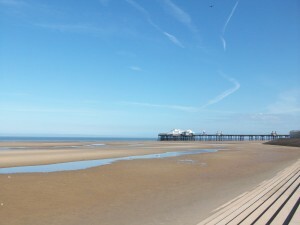 Blackpool beach in the early morning. 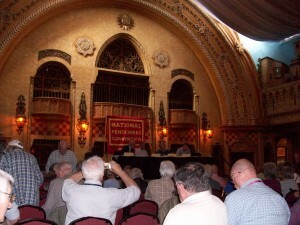 NPC Transport Conference 18th September St Pancras Church Hall. Tickets £5 each, will be available from the NPC office. Book early! UN International Day of Older Persons 1st October. Affiliated NPC groups will celebrate Oct 1st in their locality. Let us know your ideas for an event in Haringey to attract the public. We shall highlight the value of older people – the importance of maintaining universal benefits that enable us to continue to give back to society. There will be NPC leaflets. 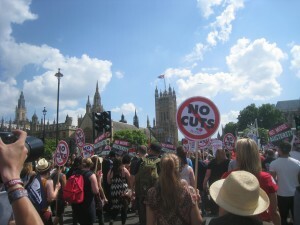 Britain Needs a Pay Rise: TUC march and rally in central London, 18th October. More details nearer the time; leaflets will be available shortly. 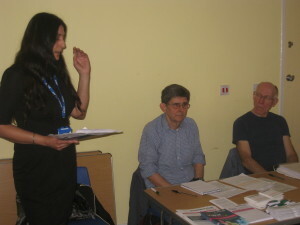 On June 26th there was a meeting at the Birchwood Centre Hall, Fortis Green Road on the State of the NHS. This was organised by the local Labour Party with speakers Dr Ron Singer, Catherine West (parliamentary candidate) and Haringey cabinet member for Health & Well-being, Peter Morton. Library Review: this is now published. 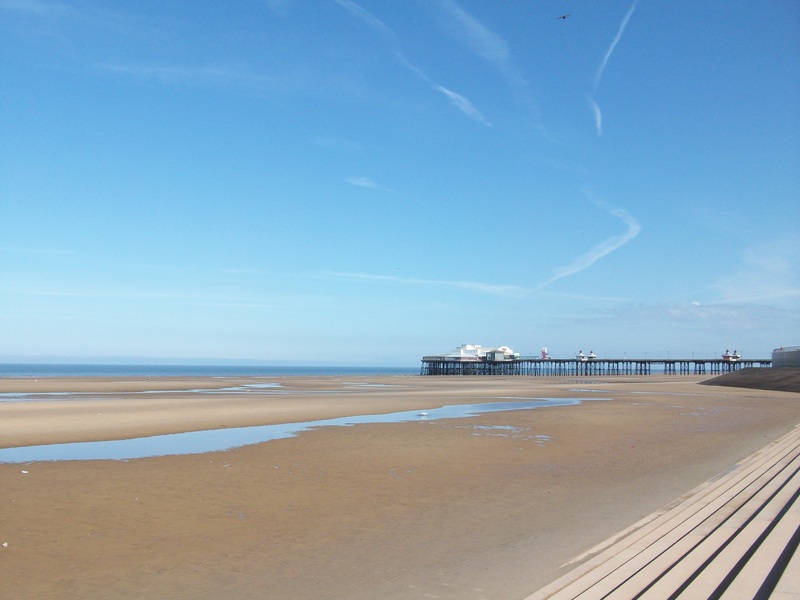 Zoe Robertson has arranged for Friends of local libraries to meet with the Chief Executive and his Strategic Leadership Team on Thursday 3 July at 11am. NOTE ALL HARINGEY LIBRARIES WILL BE CLOSED ON MONDAY 23RD JUNE to enable essential staff training to take place. Books and other items will be loaned for one day longer and items may still be renewed on-line (libraries.haringey.gov.uk) or by telephoning 0845 071 433. Ask HPAG committee for details of events at local libraries. Good or bad, Transport for All would like your reports of patient transport in London, who will use this evidence to help convince London’s NHS Trusts that patient transport contracts must put patients’ needs first. Please contact Transport for All before July 31st on 020 7737 2339 with your experiences. They can post some surveys for your group if needed. Friday 18th July 7.30pm “The story of Walter Tull” The first black footballer to play for Spurs. The first black officer in the British Army in WWI. Before our main speaker, Pamela Moffatt told us about the Haringey Forum for Older People (HFOP) for which she is chair. Several HPAG members are active in HFOP but Pamela sought more members. Clare and Eeva spoke to us from Fuel Poverty Action Group. We have a copy of her presentation. Ask if you want the notes. This group campaigns for a sustainable and affordable system for providing fuel. See their website www.fuelpovertyaction.org.uk. Of the 2012 10,000 excess winter deaths one third are attributed to fuel poverty, most being over 65. The winter in 2012 was cold but there were fewer excess deaths in colder countries. 77% of households reliant on benefit income spent more than 10% of their income on gas & electricity in colder times. The exacerbation of Arthritis & rheumatism is linked to cold housing. These conditions were prevalent in those surveyed. The Big Six energy companies made £3.7 billion retail profit in 2012 yet average fuel bills have gone up from £800 to £1,281 per year. High energy costs arise from: the rising price of gas, ‘green levies’ (this money funds insulation, renewables etc. ), retail profits of around £50-£100 per household, and payouts to shareholders. What can we do? Insulation of our homes could save £400 per year, yet this is not a priority for new building contracts. The use of ‘Fracking’ will not bring down bills, but there are some local schemes where people cooperate, such as the Solar Project on an estate in Newport & the Wales & the Brixton Energy Coop. In both projects new technology such as photo-voltaic panels have produced savings – both carbon emissions and energy costs. There have been initiatives abroad, such as the city of Hamburg recently buying back the grid from a private company after a referendum; in the USA an Electrical Workers Union refuses to cut off customers. Another way we can help is by joining Fuel Poverty Action demonstrations that aim to publicise the problems and influence decisions makers. Older people can act out graphically the plight of the ‘fuel poor’. Over the social tea-time, more questions were asked. Notices included feed-back on a busy month, Dignity Action Day and the Care.Data for GP patient health records. Our membership secretary reminds you that 2014 subscriptions are due.  (£5 or £7.50 couple) Cheques should be made out to Hornsey Pensioners’ Action Group. Please post to Mrs Pamela Jefferys, Flat 38, Bishops View Court, 24a Church Crescent, N10 3NQ, or pay at the next meeting. Post Office franchise: East Finchley Crown Post Office is to be franchised to Universal Office Equipment (U.K.) Ltd. Because of objections about disabled access, the Public Consultation has been re-launched from Tuesday, 11th February until Tuesday, 11th March. There is just time to oppose the franchise. Emergency welfare: Clive has had a reply informing us of the Haringey provision for house-bound people in any emergency such as prolonged power-cuts. W7 and 144 bus stops: Sylvia has had a reply from Joanne McCartney (GLA member). Transport for London reject having the 144 share the W7 bus stop at Muswell Hill roundabout. Do we accept this? The next Area Forum and Area Committee meeting for Alexandra, Fortis Green, Highgate and Muswell Hill is on Wednesday 12 March at The Londesborough Room, Alexandra Palace (Palm Court entrance), Alexandra Palace Way, London N22 7AY starting at 6.30pm. The ‘Report a Problem’ surgery from 6.00pm to 6.30pm will be attended by officers from the Council’s Frontline services and the Police Safer Neighbourhood Team will be in attendance. Library Review: several members have taken part in focus groups organised by the consultant ‘Activist’. There is still time to have your say on how you think library services should develop in Haringey. Ann attended Hornsey Connect on Feb 26th, organised as part of the Neighbourhoods Connect, a pilot project funded by Haringey Council and Haringey CCG to address issues of loneliness and social isolation. Lauritz investigated the availability of non-medical footcare (toe-nail cutting) free at 5 day centres and for £10 at the Laurels, St Ann’s Road. Annual General Meeting on January 22nd 2014 (full copy on request)There was an excellent attendance. Some changes to the Constitution were agreed to add extra officers. There are now two honorary presidents – Hetty Bechler joins Bob Cottingham, appointed to express our gratitude to all the group’s founder members. It was also agreed that subscriptions should be paid by June. Officers gave reports: on the website and publicity, the review of meetings and campaigns, social events, membership and current funds. The meeting thanked the officers and committee and agreed that the following should continue in post. Convenor/Secretary: Janet Shapiro, Membership Secretary: Pamela Jefferys, Treasurer: Clive Evers. Social Secretary: Celia Bower, Panel of Chairs: Ann Anderson, Lauritz Hansen-Bay, Yvonne Bonnamy. For the additional posts it was agreed that Ann & Pamela are Distribution coordinators and that Ann is Publicity officer. Delegates to GLR NPC were confirmed to be Janet Shapiro and Sylvia Roberts. Unfortunately we still need a delegate to the GLPA. Five motions, notified earlier, were proposed. These stimulated discussion and were supported unanimously. Joanne Barratt from ‘Living Under One Sun’ helps people with their energy bills. Joanne began by explaining payment types & tariffs, and how unit and standing charges affect what we are charged. The ‘Big Community Energy Switch’ works like an auction. To take part in this mass customer negotiation for an affordable deal with energy companies – or just to get advice – you would need to bring your bill to Joanne at a Library Drop-in. It could also be done online at www.haringey.gov.uk/switch. Although Joanne does not guarantee your making savings, she has helped many people reduce their bills. Those receiving pension credit or other benefits are entitled to the ‘Warm Homes Discount’ worth £135 per year, but it is mainly the bigger companies operating a ‘Care Plan’ that deliver this efficiently. Joanne narrated various problems that people experience with direct debit schemes; such as being in credit by a large amount or having difficulty cancelling a direct debit. She had many tips for saving electricity, such vacuuming behind a refrigerator – dust diminishes its efficiency, heating only enough water in a kettle, using slow cookers, wearing warm clothes, making sure one ate hot food, and the usual tips about insulation, many of which are in our booklet ‘Scrimp & Save’ that has been handed out to HPAG members. We have her Power point presentation that can be referenced. Joanne stayed to answer questions and help with the raffle. The National Pensioners Convention (NPC) has negotiated with many organisations – hospitals, local authorities etc. to sign up to the Dignity Code. We have copies of the Dignity Code or see www.npcuk.org It is important that older people are treated with respect in all situations, particularly when being cared for. During the last week of January Hornsey Pensioners Action Group members joined with Islington Forum for Older People manning a stall at Whittington Hospital where many passers by signed up in support. On February 1st – Dignity Action Day, we organised a meeting at Hornsey Library. A big thank-you to the speakers who gave up their time. 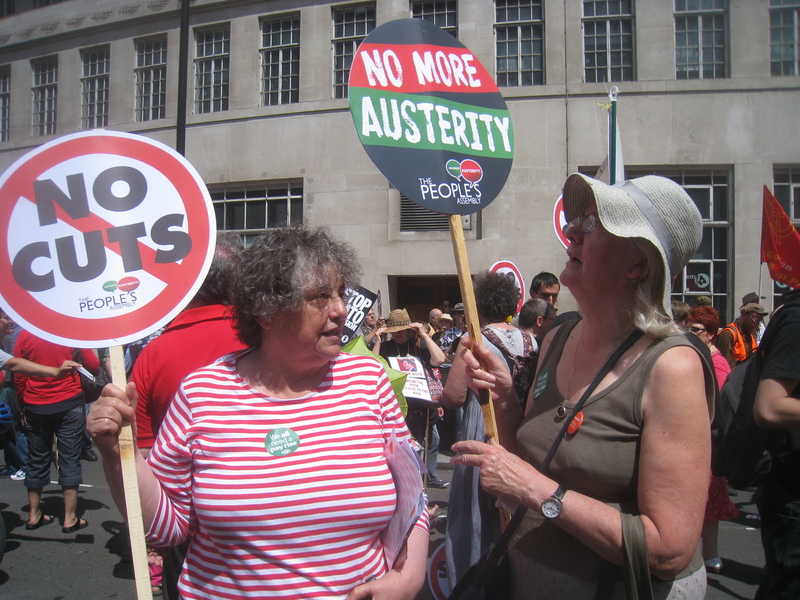 These were Councillor Bernice Vanier – Cabinet Member for Health and Adult Services, Haringey Council, Mike Wilson – Director Healthwatch Haringey, and Judy Downey – The Relatives and Residents Association. Saskia Schreuder of Haringey Forum for Older People (HFOP) also attended but Pam Moffatt was unfortunately not well. While we should have wanted a bigger attendance, there was a very useful discussion on problems with implementing the code. This was a good practice run for October 1st, United Nations Day of Older People, when our concerns could be publicised locally. Let us know of any ideas for activities. Our membership secretary reminds you that 2014 subscriptions are due. Cheques should be made out to Hornsey Pensioners’ Action Group. Please post to Mrs Pamela Jefferys, Flat 38, Bishops View Court, 24a Church Crescent, N10 3NQ, or pay at the next meeting. Look out for the article written by Pamela due to be published in the Ham & High on 20th February. Members please buy your copy! Social Lunches at Jacksons Lane are held on last Thursday of each month from 11.45am-2.30pm at Jacksons Lane. There is often entertainment. Note: Wheelchair spaces must be booked in advance and discussed with Stuart over the phone. Due to space they can only accommodate 3 wheelchair spaces. For information about the next lunch Email Stuart at [email protected] or call 020 8347 2411. If you’ve got mobility impairments and have trouble using public transport, you might be able to use subsidised taxi and minicab travel in London. The two schemes are called Taxicard and Capital Call, the latter for longer journeys up to 11miles. Tfl consults on whether the latter should be closed from April 2015. See https://consultations.tfl.gov.uk/assisted-transport/capital-call Closing date for comments is Friday 11 April 2014.